On the night of 28 November 1807 as a terrible storm lashed the west coast of Guernsey the warship H.M.S. Boreas, with one hundred and ninety-five officers and sailors on-board, found herself powerless to change course as she headed for the Hanois reef. She’d left St. Peter Port harbour during the afternoon of the 28th when she received a message that a small boat was in difficulty near the west coast with two men on board. Despite the extreme weather, the Boreas found the boat and began to tow it back towards the harbour. As darkness descended the sailors were ordered to keep a watch out for any danger. The wind was coming from the north-west, a dangerous situation to be in, the wooden warship began to roll with each roller. Suddenly a sailor called out, “There are rocks straight ahead!” Too late, the captain had no time to take avoiding action as she struck the rocks. In a deperate attempt to haul her away and off the rocks the Captain gave orders to hoist more sail. The ship advanced about two hundred yards and for a moment the men on board believed that the warship had got away. But it wasnot to be. A moment later she struck even harder on another rock and this time she was holed. The sea cascaded in dooming the ship. The two men in the little boat which the Boreas had taken in tow decided that it was time to save themselves and they cut the rope and made off towards the coast. They reached the beach but rather strangely it seems they no attempt to try to alert the authorities of the unfolding disaster. 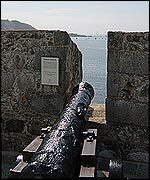 In a desperate attempt to try to alert the inhabitants along Rocquaine and L’Eree the Boreas’ cannons were fired. However they thought that it was an enemy French ship and were thius not inclined to help it. When the captain realised that there would be no help. He ordered that each man be given a measure of spirits and the small boats put into the water. One would go and seek help and the other two would take the sick and wounded ashore. They would return to the Boreas to fetch other sailors. The seamen who reached land at Pleinmont escaped up the cliffs but, it seems, could not or would not make an attempt to help their comrades. It seems that the Captain, resigning to their fate, told his crew still aboard the Boreas to find shelter in the stern of the ship. They stayed there all the rest of the night, but early in the morning around 5:30am a terrible noise could be heard and the ship slipped down the rocks and under the sea. The crew was thrown into the sea. Some, however, managed to climb up the rocks or on to rafts which they had made from driftwood during the night. The captain managed to climb on to one of these rafts, but died after a short time and the sea took his body. When light came, the men on the rocks were saved by fishermen from Rocquaine who, at last, decided to go to sea to see what was happening. 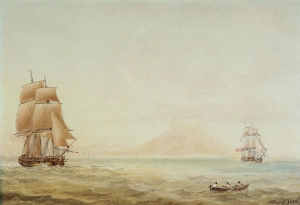 In a letter from Vice-Admiral Sir James Saumarez, (who was in charge of the navy in Guernsey), to the Admiralty in London, he said that he had sent two ships, the Brillant and the Jamaica to Les Hanois to aid the Boreas but they could do nothing for the wreck. They did however save 30 men from the Hanois reef and other men from the small boats were saved as well. He mentioned, also, the courage and good behaviour of Captain Robert Scott, his officers and crew during this terrible night. With great regret he had to report that the captain and more than 120 of the crew had been lost. At the enquiry in December 1807, at Portsmouth, the captain, the officers and crew were exonerated from all blame except for those who had escaped up the cliffs when they landed. Just over 50 years after the wreck, Les Hanois lighthouse was built with the light being lit in November 1862. 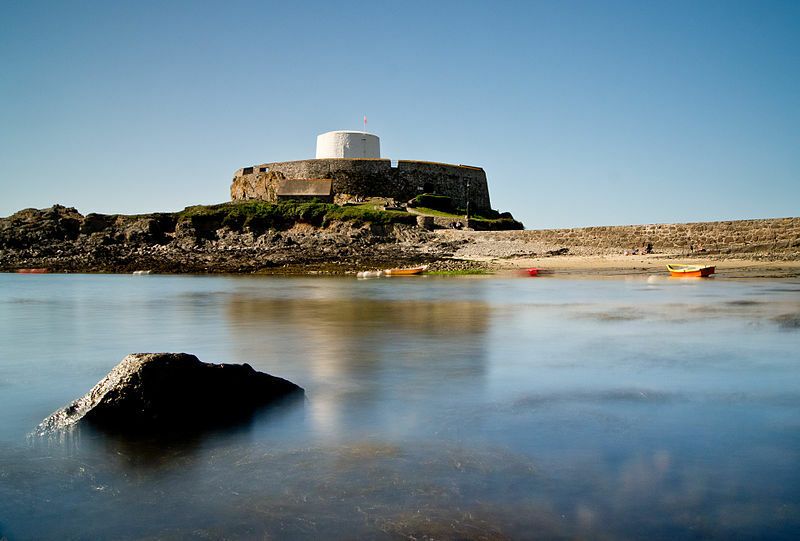 Relics from the wreck can be seen today in the Fort Grey Museum at Rocquaine.